The Camp Nou experienced a night to remember in an emotive commemorative match for the heroes of Wembley 92’. 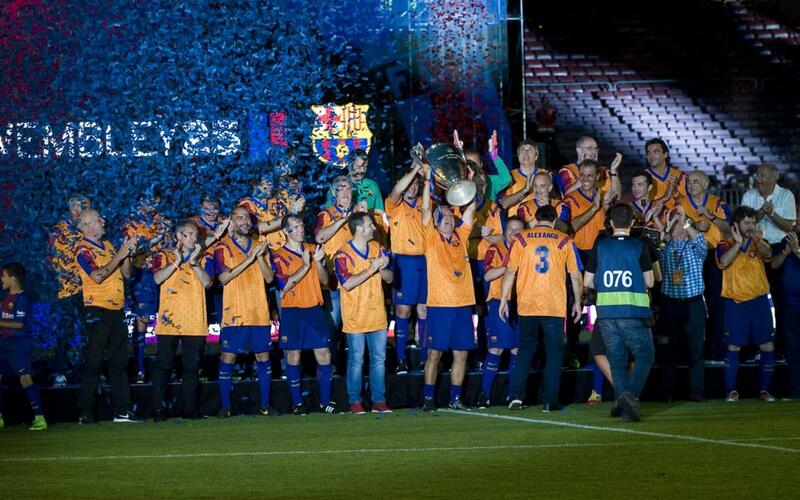 Various events have taken place in the last month to celebrate the 25th anniversary of to the Club’s first European Cup victory. On Saturday night, the culmination of those celebrations took place with a seven-a-side match against the Benfica veterans. The day started at 12.00pm CET with a fan zone at the Camp Nou and it ended with an emotional tribute to the squad who made history. Each player was announced as they came onto the pitch to a standing ovation. A big screen was set up in the stand and the players and coaching staff from that period were celebrated in front of an image of Club legend Johan Cruyff. The night also served to pay tribute to the renowned stadium announcer Manel Vich. Before the seven-a-side game, children from the FCBEscola warmed up with various ‘rondo’ excercises on the pitch and they represented the Masia and FC Barcelona’s values started by the Dream Team who changed the Club’s history. The crowd were excited to see the legends from the Dream Team in their old kit on the pitch at the Camp Nou once again. The match had lasted twenty minutes each half and it ended in a 0-0 draw. During the break, the players’ children took part in a small match as well. Another memorable moment was the recreation of the incredible Koeman free-kick which gave Barça their first European Cup against Sampdoria at Wembley. The unforgettable goal will go down in Barça’s history and it continues to be a crucial moment to this day. The tribute ended with the full squad lifting the European Cup once again on a night in which the Dream Team made Barça fans smile once again. They were a unique team who changed the course of this Club’s history.